"We see the Social Democrats as being in a very convenient situation – being in the coalition, not voting for strategic reform, occupying the posts of ministers and committee chairmen, using all the privileges, but not being held accountable. I personally believe that the Social Democrats will not leave the coalition. R. Karbauskis assured today that the relations between the coalition partners are consistently improving. 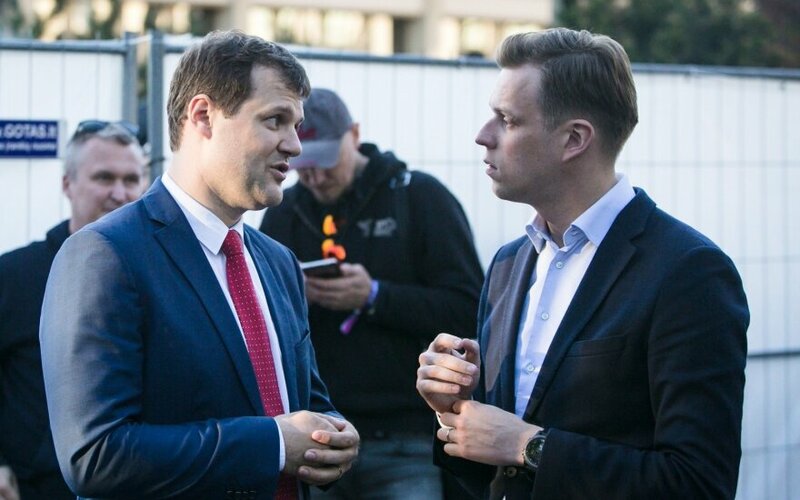 I believe this will continue – the cabinet will successfully continue proceeding without Social Democrat support," G. Landsbergis spoke on the majority's disputes, LRT.lt reported. 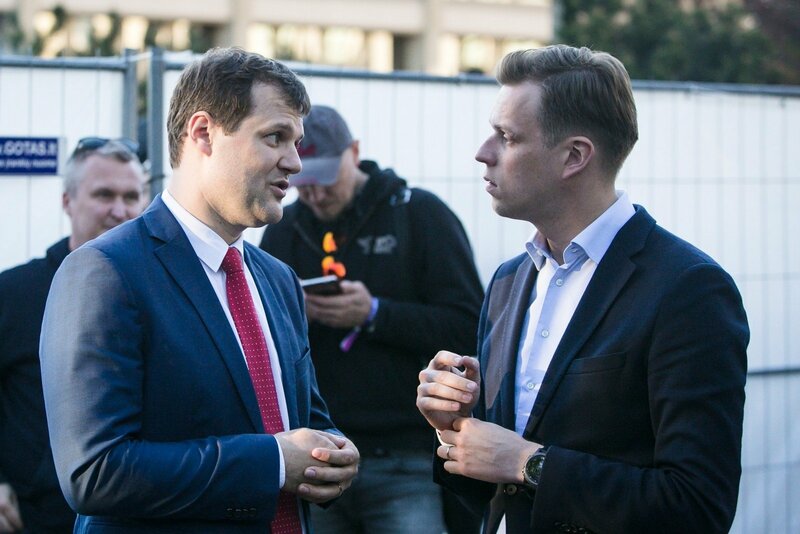 The crisis in the coalition government was discussed with Lithuanian Farmer and Greens Union group deputy prefect Virginijus Sinkevičius, Homeland Union – Lithuanian Christian Democrat chairman Gabrielius Landsbergis, Social Democrat group prefect Andrius Palionis and Liberal Movement group prefect Eugenijus Gentvilas. A. Palionis notes that in terms of the coalition's partners and coalition overall, his group finds there to be a lack of communication. He explains that the coalition partners had formed a joint team for discussions on forestry reform, but the teams never held meetings. In terms of the coalition agreement he notes that support from other Seimas groups could be pursued, if values or views diverged, so he does not see any major missteps on part of their "Farmer" partners. E. Gentvilas states that he wishes for a strong and effective coalition, rather than one that needs to barter with the opposition. He notes that formally a coalition exists, but it is currently on the verge of non-functioning and there being no agreement in a wide variety of questions within it. The notions that there is a lack of dialogue are rebuffed by V. Sinkevičius, who responds that coalition representatives gather for discussions every Tuesday, Wednesday and Thursday. Views just completely diverged regarding the forestries, where the Social Democrats were unwilling to compromise and as per agreement, the parties voted as per their individual stances. The politician explains that a blow to the coalition would rather have been if the Social Democrats stated one thing during meetings, but voted otherwise, while this time matters were fully clear. G. Landsbergis turned to the need for a solid and stable coalition, also stating that "We see the Social Democrats as being in a very convenient situation – being in the coalition, not voting for strategic reform, occupying the posts of ministers and committee chairmen, using all the privileges, but not being held accountable," and that "I personally believe that the Social Democrats will not leave the coalition. R. Karbauskis assured today that the relations between the coalition partners are consistently improving. I believe this will continue – the cabinet will successfully continue proceeding without Social Democrat support." Landsbergis points out that budget planning awaits in autumn, as does tax reform, which according to him will proceed similarly to now – somewhat hamstrung. The "Farmer" representative denies such an evaluation from the Conservative leader, calling such claims rushed and stressing that in regard to strategic questions, support can successfully be garnered in Seimas. This does not, however, convince the opposition representatives, with G. Landsbergis pointing out how Gintautas Paluckas, the Social Democrat party chairman has identified the current coalition as meaningless, with E. Gentvilas chiming in that the project that passed in Seimas and V. Sinkevičius referred to in terms of consensus was made not by the "Farmers", but namely by him and G. Landsbergis. When asked why the Social Democrats are so opposed to establishing only a single forestry, A. Palionis points out that while his party was always in favour of the reform, they were not satisfied with the status of the forestries changing from a juridical entity to branches. He stresses that as a result of current agreements, it will be only possible to cut up to 7% of forestry lumber in the regions, which, according to him, will only suffice for people to burn in fireplaces and not enough for small lumber mills. When queried about potential scenarios considering the tax reform that is expected this autumn, E. Gentvilas reminds of the Butkevičius cabinet, which, he stresses, also struggled, but even with the withdrawal of the Polish Electoral Action in Lithuania still managed to proceed. He calls upon the Social Democrats to not wait until autumn with their decision because it would be particularly harmful if they chose to withdraw in, for example October, when numerous important decisions, including passing the budget, have to be made. The veteran politician points out that if the Social Democrats do choose to depart the coalition, it should be done prior to the autumn session, to ensure that a new cabinet could be formed immediately upon returning. V. Sinkevičius denies suggestions that his party will be forced to change its stance on the VAT exemption for heating. He explains that the "Farmers" have been consistent regarding the question, within reason, pointing out that the matter was limited by budgetary constraints, albeit that the government has now found funding. G. Landsbergis rejects the matter being seen as a trade and highlights that the opposition registered legislative projects to retain the VAT exemption at least twice. He stresses that what matters is not even how big the exemption rate may turn out to be, but that it is going to be discussed in Seimas at the suggestion of cabinet, which will mean that citizens will have to pay less during the upcoming heating season than originally forecast. "We see the Social Democrats as being in a very convenient situation – being in the coalition, not voting for strategic reform, occupying the posts of ministers and committee chairmen, using all the privileges, but not being held accountable. I personally believe that the Social Democrats will not leave the coalition. R. Karbauskis assured today that the relations between the coalition partners are consistently improving. I believe this will continue – the cabinet will successfully continue proceeding without Social Democrat support," G. Landsbergis spoke on the majority's disputes. V. Sinkevičius denies suggestions that his party will be forced to change its stance on the VAT exemption for heating. He explains that the "Farmers" have been consistent regarding the question, within reason, pointing out that the matter was limited by budgetary constraints, albeit that the government has now found funding. G. Landsbergis rejects the matter being seen as a trade and highlights that the opposition registered legislative projects to retain the VAT exemption at least twice. He stresses that what matters is not even how big the exemption rate may turn out to be, but that it is going to be discussed in Seimas at the suggestion of cabinet, which will mean that citizens will have to pay less during the upcoming heating season than originally forecast. Coalition - a party of three?